Gold and yarn; 9 x 8 1/2 in. Marvel Studios’ newly released Black Panther (2018)—a film about T’Challa, the superhero monarch of the fictional African nation of Wakanda—features an incredible fusion of traditional African design and futuristic fashion. According to the film’s head costume designer, Ruth Carter, elements from the Maasai, Himba, Dogon, Basotho, Tuareg, Turkana, Xhosa, Zulu, Suri, Dinka and many more African peoples went into over 700 costumes created for the film. In this post, we look at African items of clothing and adornments from the Bowers Museum’s collections which may have served as inspiration for the costumes in Black Panther. These earrings from the Fulani people of Mali were first featured on the blog in 2007 and have been on display in the Bowers Museum’s Thomson Foyer almost as long. During Black Panther, we briefly see an almost identical pair worn by a woman during T’Challa’s coronation. Physical beauty is immensely important to the Fulani, and adornments are an important way of improving one’s appearance. Despite their size and weight, the earrings usually hang from the lobe of the ear. As each earring weighs more than half a pound it is likely they would be supported by a supplemental strap. Earrings like these are very important to Fulani women who receive them from their groom or inherit them from their mother. Additional gold is added to earrings over time, increasing their value and prestige. Leather and beads; 4 x 10 in. Ruth Carter confirmed that much of the inspiration for the Dora Milaje group of women warriors came from the Maasai tribe of Tanzania. This can particularly be seen in their clothing, hair, and adornments. The all-red armor worn by the Dora Milaje is a signature color of both men and women of the Maasai, who traditionally wore animal skins dyed with a vegetable pigment. It was thought that the bright color scared away lions and served as a natural camouflage against the red earth of Tanzania. The signature adornments of the Dora Milaje are vibranium coils worn around the neck and arms. Similar coils made from made of iron, brass, or copper were worn by many peoples from the greater east-central African region, including the Dinka, Maasai, Turkana, Toposa, Rendille, and Pokot. 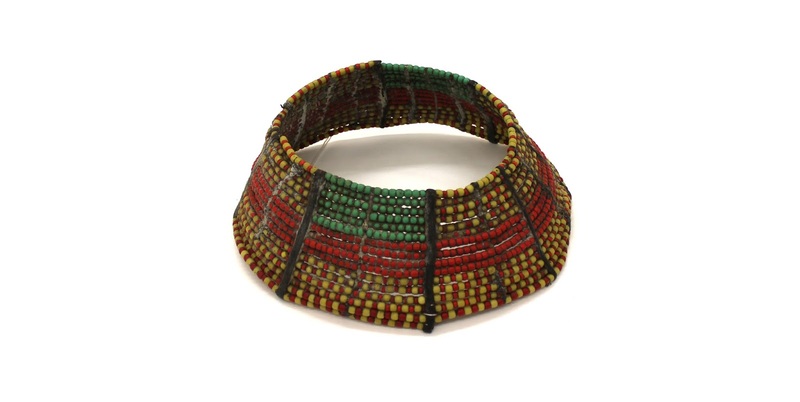 Since the introduction of glass beads in the 19thCentury, the same styles of neck coils have evolved into objects like this Turkana beaded collar. Leather and ostrich feathers; 24 x 32 in. Like the Fulani earrings, a similar headdress to the above is briefly seen in Black Pantherworn around the face of one of the attendees of T’Challa’s coronation. It is called an enkuraruand is worn by morran, a class of Maasai male warrior herders. The enkuraruis worn exclusively by morran who have yet to successfully hunt lions. The design of this headdress is interesting as it bears a purposeful likeness to the feline’s mane. The headdress was traditionally used for tribal warfare but is now primarily used ceremonially. Enkuraru are primarily composed of leather with small straps that secure the surrounding ostrich feathers. 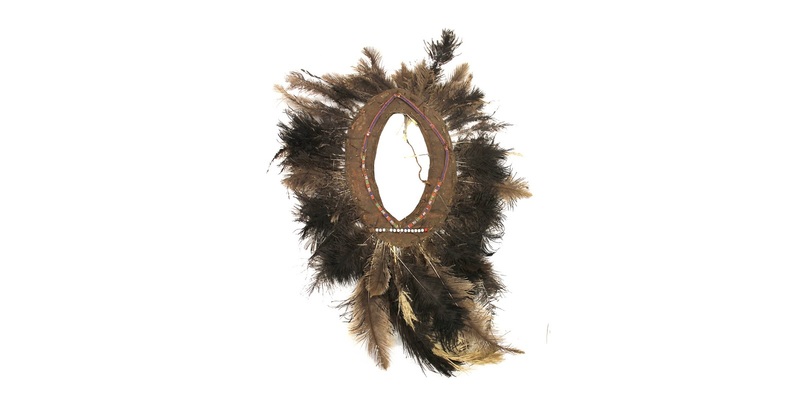 Like many types of clothing and adornments from the region, the headdress also features colored glass beads, which are worked into a leather band attached to the headdress. Wood and pigments; 27 in. The mask taken by Eric Killmonger from the fictional Museum of Great Britain does not have an exact match in African culture, but it is likely inspired by Mgbedike masks worn by the Igbo culture of southern Nigeria. These helmet masks can vary widely in form, but most have mixed anthropomorphic and zoological features. Aesthetically, the Bowers mask may appear to only have a pair of horns in common with Killmonger’s mask, but the lack of characteristic Igbo mask features is probably more due to a conscious decision to give the mask a unique appearance than anything else. We can see this in both the lack of pigmentation and the lower portion of the mask featuring Islamic-inspired wooden knots common to the woodwork of Somalia. Mgbedike masks are intended to serve as male counterparts to the Igbo’s maiden masks at during funerary ceremonies, and as such strongly emphasizes masculine features. Text and images may be under copyright. Please contact Collection Department for permission to use. Information subject to change upon further research. Edward Kienholz Painting, "Point Pink"